The days of cycling in the dark or regularly replacing dead flashlight batteries will soon be over with the rechargeable bike lights as they are aimed at making your cycling more fun, comfortable and also safer. Cyclists are usually exposed to poor visibility due to bad weather or longer nights. This means that they have to strain their eyes to see further ahead, risk bumping into obstacles, getting lost in the woods, or even being involved in an accident. Unlike motorized vehicles, bikes have to depend on a dynamo which only works when the bike is in motion or lights that run on disposable batteries. Thankfully, you can invest in a reliable and functional rechargeable bike light that provides instant and good illumination whenever you need it. Lumens: This basically means the strength of the light and the higher the number the more powerful the light beams. It ranges from 5 to 1000s lumens with the front lights producing more light than rear lights. Battery Type: It’s vital to go for batteries that charge faster, yet last longer. The common types of rechargeable batteries are Lithium Polymer (Li-Po) and Lithium Ion (Li-Ion). Charging Systems: The batteries are recharged by either a charger or USB. Some come with a built-in USB connector hence don’t require a charging cable. Mounts: A good light is easily mounted on the handlebars and will remain firm and secure even when cycling in rough and bumpy terrains. The light is mounted by straps, bands or a clamping system. The Gator 320 bike light from Blitzu comes in small and compact size that can be mounted on any handlebar without using any tools. It produces 320 lumens of light and comes with 4 lighting modes, high, medium, low and flashing. With the brightest (highest) having a runtime of 2 hours while the lowest is 6 hours. Recharging the battery takes 2 hours and can be done via a computer, phone charger, cell phone, powerbank or any device with a USB charging port. 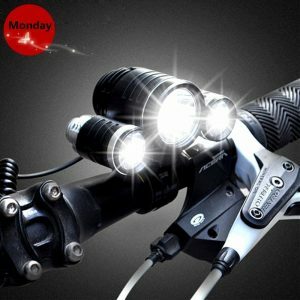 The rechargeable bike headlight by Bright Light is ideal for most bikes and is extremely bright. It delivers 1200 lumens via a rechargeable 6400mAh battery with the light lasting for more than 3 hours on the highest setting, 5 hours on medium and more 26 hours on the lowest setting. 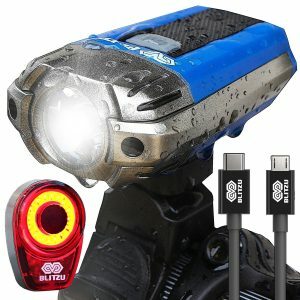 The light is waterproof and suitable for use in wet conditions and is recharged via USB port. 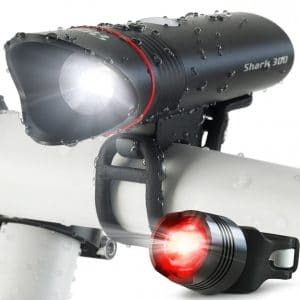 Stay safe even while cycling in the dark with the rechargeable bike light by Cycle Torch. The easy-to-mount headlight produces 300 lumens and comes with a quick release. Its sturdy construction and 360-degree protection safeguards it against bumps, falls, knocks and much more. The rechargeable light can fit on the handlebars of most bikes and will illuminate your path for more than one and half hours on high beam. The bikelight is quite bulky compare to others. 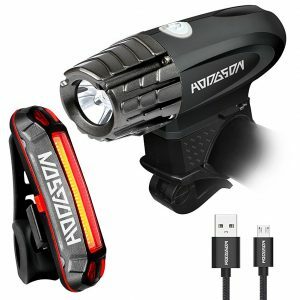 Featuring a splash-proof design and consisting of sturdy design, the USB rechargeable bike light by Hodgson enhances proper lighting and safety when cycling in poorly-lit areas or in the dark. The light can reach a distance of up to 330 feet and at an angle of 120 degrees and comes with 4 modes: High, Mid, Low and Flash mode. And to save you money for buying new batteries, it is recharged with the included USB cable via computers, laptops, powerbank, cell phone charge or any device with a USB port. Enjoy up to 500 lumens of light when riding your mountain, city, road, hybrid or any other cycle. Designed to fit on almost any handlebar, the superbright LED bike light by Cycle Torch is easy to mount and also release. It comes with different light setting and will last for as many as 15 hours on low mode and for 30plus hours on daylight/flash mode. However, it can take as many as 4 hours to fully recharge the battery. You shouldn’t spend lots of money on batteries when cycling in the dark. 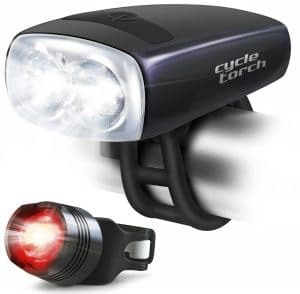 The Night Owl torch by Cycle Torch comes in a small and compact size and can be mounted on most handlebars. It relies on two LED lamps to produce bright light with an output of up to 200 lumens. For maximum safety and illumination, it has a wide beam and also comes with a flash mode for daytime commuting. The battery lasts for more than 2 hours when operating in high beam and more hours on low setting. The water-resistant lights are completely suitable for any situation. 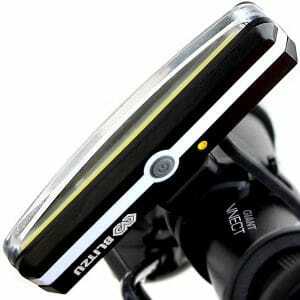 The Blitzu Cyborg 168H light can be mounted either vertically or horizontally on most bikes. It consists of 50 micro-LEDs that produce 168 lumens and are housed inside an impact resistant, durable and water resistant (IPX4) case. 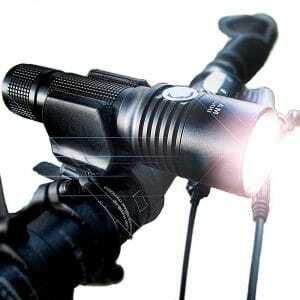 The bike light comes with 6 modes: low, medium, high, 50% flashing, 100% flashing and strobe light. It takes 2 hours to recharge the batteries which will last for 1 and half hour on the brightest mode and around 5 hours on strobe mode. The night will become brighter after installing the rechargeable bike lamp by Benran LED. 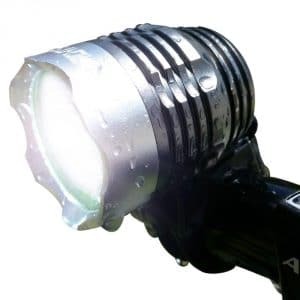 The powerful 5000 lumens LED light is made from abrasion and rust resistant aluminum alloy and comes with 4 modes ranging from high to strobe/flashing. It is waterproof and has a 90-degree adjustable angle while the XM-L LEDs last for 100,000 plus hours. The pack comes with 2 rechargeable batteries, a headlamp, a flashlight, USB charger, car charger, carry bag, and led stents. The full charge of the battery is needed quite a long time up to 12 hours. 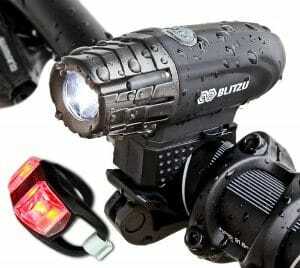 The Gator 390 bike headlight from Blitzu is fit for use on the road, mountain, city, kids and other types of bikes. It is constructed from a durable and light material and weighs only 56 Grams while it has a waterproof rating of IPX5. Rated at 390 lumens, the USB rechargeable light will illuminate even the darkest areas and will cover a distance of up to 300 feet. On the highest setting, it provides high beam lighting for more than 2 hours. 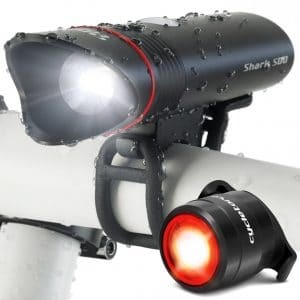 Producing up to 860 lumens, the Vision II 860 light by Magnus Innovation is one of the brightest bike lights in the market. It is constructed from high-grade aircraft aluminum alloy and can tolerate the harsh outdoors and weather. The universal light is easy to install, doesn’t require any special tools and can fit on most handlebars. It also comes with a quick-release mechanism and is water resistant. Charging the light is made easy by the built-in Micro USB port and you can expect as many as 25 hours of pure brightness. 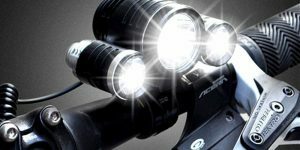 The above review should guide you to choosing the best rechargeable bike lights in the market. The main focus during the assessment was a light that produces good illumination, was easy to fit, run on batteries that lasted for long and could be easily charged via a USB port. All the listed products not only meet the recommended standards but also feature among the most viewed and high rated product, you can, therefore, be certain that they are worth the money, effort and time. Awesome and detailed article. Nice job!